It is quite easy to detect a TNT-Audio page or review among thousands of others: our pages don't contain a single word of advertising and are FREE for the audiophile worldwide community. It is less easy to detect the guys behind this revolutionary editorial adventure in HiFi, when they attend HiFi Shows, fairs, seminars, concerts, pizza hot's etc. Unluckily the TNT-Audio reviewers' pictures published into their own bios aren't good enough to show their beauty as it looks like in the real World. Some of them are even so shy they didn't add a picture to their bio. So far, so good, so what? 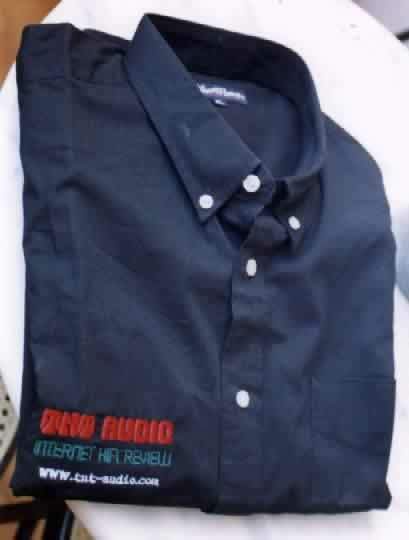 Here it is: the official TNT-Audio shirt you can see at your left: a full black shirt (like the background of our pages) with an embroided racing red TNT Audio logo and the green "Internet HiFi review" writing slightly above the white URL of our (and your) TNT-Audio web site. The shirts are made out of a solid twill cotton (built to last!) and they are quite comfy to wear (so they don't affect listening tests :-)). The design is by yours truly (the Almighty Editor here) and the embroided logo has been chosen for its durability and cool looks. The picture, as usual, doesn't give an idea of the real quality of the item. The shirts are all plain black (Real men wear black, after all :-)) except geoff Husband's one, which is plain white (a touch of class). Following a well established tradition here at TNT-Audio :-), all the expenses have been covered by yours truly so the shirts are a free gift for the precious collaborators. Now, I can hear you asking...NO, the official TNT-Audio shirts are NOT available for you dear readers or for anyone who is not into the official TNT staff. We're not cruel, we're just trying to avoid any confusion and the plain nightmare of a worldwide distribution of thousands of shirts :-) So, please, don't ask. Keep your spirits high, though, as we could think of something else (baseball caps or stuff like that) with the same embroided logo. We're not even planning to do that but if we were to decide, we'll keep you informed, for example by means of our cool and lively HiFi discussion forum. Public enemy number 1, understand? the TNT-Audio crew is back in town...!! !